Gone are the days when replacements were a process that lasted entire seasons before coming into effect. Managers had to go through entire chunks of bad form before even being considered for a sack, and that too, often ended up in a forgiving nature. However, the modern game has changed all that, and as few as three defeats at a European powerhouse can chime the warning bells and be a cause for much worry. Regardless of whether or not one’s job is in danger when the name is big, the media is ever eager to pounce and create speculations, with replacements being lined and the work of scouting teams arguably cut out when it comes to deciding who to sign next. A similar saga might be underway in the case of Jose Mourinho, who may have had to receive a call from his prospective successor in order to calm things down. 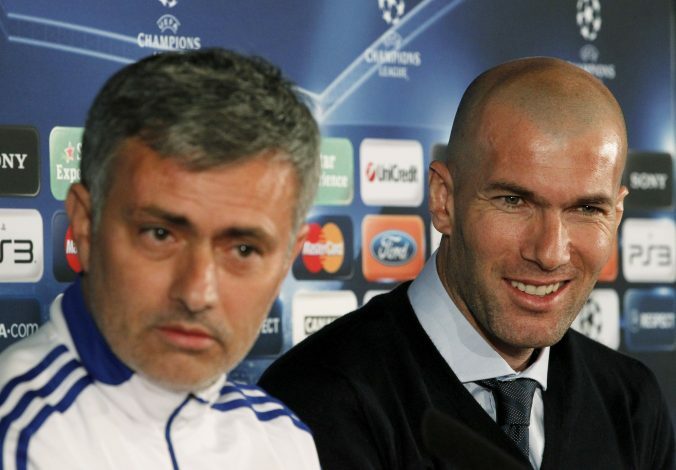 As per a report in The Sun, Jose Mourinho received a call from Zinedine Zidane, with the Frenchman convincing the gaffer that he wasn’t after the top spot at Old Trafford. The former Real Madrid manager has practically been assigned the top spot already by several commentators, and the fact that he is a man without a job in the face of a Manchester United side that seems headed for crisis doesn’t help either. The report goes on to add that Zidane informed Mourinho that all that occurred pertaining to any possible move was that his representatives had quizzed him on any potential interest at managing the Mancunian giants. While the credibility of this claim is not known, it seems unlikely that this will have calmed Mourinho down. Further still, it is easy to say that Zidane isn’t an easy name to ignore, what with his relatively young resume already boasting what managerial giants have failed to achieve in decades.